Well, 25 years India has been waiting for this day. Will India be able to break the losing record of bilateral series against RSA in South Africa? In Today Dream11 Fantasy Cricket Prediction of IND Vs SA 4th ODI we will try to find out and analyze all the factors. In this post, we will provide you a detailed analysis of the playing 11, pitch report and statistics, Keys players to select for your dream11 fantasy cricket leagues. We will also cover what astrology has to say. We will cover everything so that winning chances become 100% safe and secure. Play small leagues to increase your chance of winning. Best Players for Captain and Vice-Captain For Fantasy Cricket. 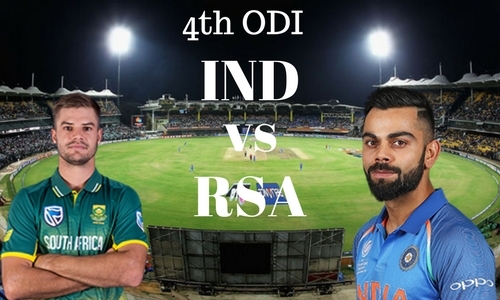 Match: India Tour of South Africa,2017-18, SA vs IND, 4th ODI. Venue: Johannesburg, New Wanderers Stadium. Average first inning score is 316. Average second inning score is 231. Highest total in this ground was 439/2 in 50 overs by SA v WI. Lowest total on this ground was 163/10 in 39.2 overs by SA v SL. New Wanderers pitch is good for batting but it is expected a bit of shower in the morning, although it will not affect the match. If in any case if there is rain in the morning then it will help the seamers initially. Fast bowlers took 8 wickets in the last match played on this pitch. Rabada took 2 wickets, Chris Morris took 1 wicket and Phehlukwayo took 2 wickets. In morning Patchy rain is possible and in afternoon and evening, it will be partly cloudy. The maximum temperature will be 26-degree Celsius and minimum temperature will be 19-degree Celsius. Virat Kohli (c), Ajinkya Rahane, Shardul Thakur, MS Dhoni (wk), Kedar Jadhav, Mohammed Shami, Rohit Sharma, Bhuvneshwar Kumar, Axar Patel, Kuldeep Yadav, Shikhar Dhawan, Jasprit Bumrah, Dinesh Karthik, Yuzvendra Chahal, Hardik Pandya, Manish Pandey, Shreyas Iyer. AB de Villiers, Aiden Markram (c), Jean-Paul Duminy, Tabraiz Shamsi, Hashim Amla, Heinrich Klaasen (wk), Farhaan Behardien, Chris Morris, David Miller, Morne Morkel, Kagiso Rabada, Khaya Zondo, Imran Tahir, Lungisani Ngidi, Andile Phehlukwayo. As Kohli will love to win the 4th ODI so there is no chance that he will change the team. Virat Kohli (c), Ajinkya Rahane, MS Dhoni (wk), Kedar Jadhav, Rohit Sharma, Bhuvneshwar Kumar, Kuldeep Yadav, Shikhar Dhawan, Jasprit Bumrah, Yuzvendra Chahal, Hardik Pandya. Ab de Villiers will join the team and play, as Morris has already told in the press conference that AB is 100% fit and he will play the match, so Zondo will not play. Morkel took rest in the 3rd ODI, so he will play in the 4th match. AB de Villiers, Aiden Markram (c), Jean-Paul Duminy, Hashim Amla, Heinrich Klaasen (wk), Chris Morris, David Miller, Morne Morkel, Kagiso Rabada, Imran Tahir, Andile Phehlukwayo. MS Dhoni: Dhoni is a very good choice for dream11 but as he bats very late so he gets less number of balls to play. If we see the fantasy points of MSD, his points were 8.5, 6 and 15. He was selected by 45.57% of fantasy cricket users in the 1st match, 27.55% in the 2nd match, 42 .74% in the 3rd match and in the 4th match he was selected by 38.35% of the users at the time of writing this post. Heinrich Klaasen: In the previous prediction we have mentioned the details of Heinrich so you can have a look at that cricket prediction. Klaasen batted 4th down in the last match and as RSA find very difficult to handle the twin spin attack of IND, so he will get more chance to play. In the last match, he contributed with 17.5 points and he was selected by 44.36% of the users in the last match. 61.66% of dream11 users have selected him in the 4th match. Pro Tip: Keep Klaasen on your team as he will get more balls to play but if you are playing with more than one team then make teams in a different combination. Virat Kohli: In the last match Kohli has scored 160 runs in 159 balls. His performance was very consistent in the last three matches. He has contributed 71,28 and 102 points in the last three ODI. 88.84% have selected him in the first match, 88.24% in the 2nd match, 90.6% in the 3rd match and 82.62% have selected him in the 4th match. Rohit Sharma: Rohit Sharma have performed very bad in this series but you can’t ignore him as he can blast any time on his day. He has contributed with 14, 11.5 and -1 points in last three ODI and he was selected by 63.24, 64.29,63.4 and 35.15 percent of the users in the last matches. Shikhar Dhawan: Dhawan has played a decent knock in the last inning. Shikhar has contributed with 22.5, 34 and 48 points. He was selected by 43.89%, 55.66% 68.09% and 76.75% of the users in the last matches respectively. AB de Villiers: De Villiers has not played the last three ODI as he was out because of the finger injury. In the 4th match SA will change their jersey color to pink and if we see ABD record in pink Color jersey then it’s a threatening sign for India. His record in the pink dress is outstanding. He has scored 450 runs in the last five games with an average of 112.5. Pro Tip: Make a combination from the above list. If you are playing with more than one team then keep Rohit Sharma as a Captain in the grand league as you can see above that only few people have selected him. Pro Tip: Try to select more RSA players as they will get more chance of batting. Pro tip: Play with five bowlers and Keep Kuldeep Yadav and Yuzvendra Chahal in your team. India is in tremendous form and South Africa has no answer of leg spinners. So Stats suggest that Ind will win. According to astrology also Men in blue will win. The experts of cricket say that India will win the toss and they will decide to bowl first as Proteas has no answer for Kuldeep and Chahal. If RSA wins the toss they will also decide to bowl first. Conclusion: We have this much for Today Dream11 Fantasy Cricket Prediction Of IND Vs SA 4th ODI. What is your thought in this? Mention in the comment box.